Earning a marketing master’s degree online leads to career advancement and higher salaries. According to PayScale, the average salary for a marketing director who holds a master's degree is $104,256 per year, which is over $30,000 more than a marketing director with a bachelor's degree. Marketing master's degree programs include MS and MBA degrees and various concentration options to allow students to choose the path that best serves their professional goals. Plus, with the flexibility of online programs, you can work full time while you earn your master's in marketing. University of North Carolina at Chapel Hill ranks #1 on The 50 Best Online Master's in Marketing Programs! Marketing has changed dramatically as internet-based ventures have become increasingly ubiquitous; this is the focus of the online master's in marketing at the University of North Carolina at Chapel Hill. Offered as part of the MBA program, this program's curriculum explores the new frontiers of product promotion by emphasizing mobile technology, social media, and e-commerce. The 66-credit program combines global marketing best practices with the management-oriented skills taught in all MBA@UNC programs, including business strategy, decision making, communication, and analytical thinking. The online MBA at UNC's business school has received national recognition, and students can complete their degrees without ever stepping foot on campus. Participants typically take two classes per quarter and earn their diplomas in two years, although they have as many as three years to finish. The university delivers coursework both asynchronously, using a variety of multimedia tools (including UNC's own mobile app), and through real-time online meetings. UNC keeps class sizes to 15 or less, providing distance learners with increased personal contact with their professors and peers. The program has several beneficial features, including the ability to take online classes at several other top institutions, including George Washington University, the University of Southern California, and American University. Graduates of this program can also revisit their coursework and lectures anytime in the future and sign up for courses for a small fee to keep their skills current. The school sponsors global immersion seminars, letting students experience business and culture in cities across the world. The University of North Carolina at Chapel Hill is regionally accredited by the Southern Association of Colleges and Schools Commission on Colleges. Pennsylvania State University ranks #2 on The 50 Best Online Master's in Marketing Programs! Penn State's business college has offered an online MBA for years, and the program was recently updated to incorporate a larger number of concentrations, including marketing analytics. The prestigious Association to Advance Collegiate Schools of Business (AACSB) accredits the university's master's in marketing. This program was set up to provide a customizable degree for busy, working professionals. It follows the department's “ICE” framework, which is a teaching and learning approach that focuses on integration, collaboration, and engagement. The teaching staff expects students to invest at least eight hours per week per course. Students can complete the 48-credit online marketing master's degree largely online, although they must attend a five-day residency at Penn State's campus in University Park, Pennsylvania at the outset of the program. During this residency, students attend seminars, meet faculty and fellow students, and enjoy guest speakers from the world of business. Coursework is delivered asynchronously, although students who prefer a higher level of engagement can find real-time alternatives. The marketing concentration comprises nine credits in brand management, data acquisition and customer retention, and marketing communications. Penn State's online marketing master's requires has no specific prerequisites, and candidates with a bachelor's degree in any field may apply. However, the school does give preference to students with a background in a business-related field. Applicants without a Ph.D must submit their GRE scores. Pennsylvania State University is regionally accredited by the Middle States Commission on Higher Education. Northwestern University ranks #3 on The 50 Best Online Master's in Marketing Programs! Integrated marketing communications (ICM) has been one of the biggest trends in advertising and promotion since the late 1980s. Northwestern University has developed an entire curriculum focused on this comprehensive, holistic approach. This Evanston, Illinois institution offers a master's of science in this field through its journalism, media, and integrated marketing communications school. The 13-credit program defines IMC as a data-driven marketing strategy based around the customer, and it immerses students in important IMC tenets like brand building and consumer engagement, teaching them to use quantitative and qualitative information to solve marketing challenges. Northwestern's online master's degree in marketing is designed for working professionals; the average age of students in this program is 33. The program can be completed in two years, with students typically taking two courses per quarter, although individuals have up to five years to finish the program. The curriculum is built around five credits of core classes, and degree seekers use the remaining eight elective credits to tailor coursework to match their career goals. Students complete most work asynchronously, although distance learners may need to attend occasional live sessions and connect with their peers on a regular basis. Participants have the option of pursuing some of their credits around the world; the school hosts two-week sessions in Asia, four-week sessions in London, and a weeklong course in San Francisco. Individuals can also elect to enroll in a five-day leadership seminar at Northwestern's main campus. The program has four start dates each year. Applicants must have a bachelor's degree and submit their GRE or GMAT scores, an essay, references, and a resume. They must also complete an admissions interview. Northwestern University is regionally accredited by the Higher Learning Commission. The University of Alabama ranks #4 on The 50 Best Online Master's in Marketing Programs! The University of Alabama's online marketing master's degree program has a built-in marketing analytics speciality. Offered by the Tuscaloosa university's college of commerce, this 33-credit program explores the modern science of data analytics. The program provides a strong foundation in traditional marketing skills, and students also learn to analyze marketing statistics, demographic information, and consumer data to build comprehensive marketing strategies. Along with classes in marketing product management and global marketing management, participants learn about data mining. The program also emphasizes MBA staples like communication, scheduling, and effective leadership. Alabama's online MS in marketing degree with a specialization in marketing analytics carries accreditation from the AACSB, which is something that only 5% of business programs in the U.S. can claim. Coursework is offered entirely online, with no visits to Tuscaloosa necessary, and students attend most classes asynchronously. The school splits the curriculum in half between marketing and statistics courses and includes a marketing capstone project. The program typically takes two years to complete, but graduate students have up to five years to earn their diplomas. Applicants must submit their resume and have a bachelor's degree, a minimum GMAT score of 580 or GRE score of 308, and have earned a “B” grade or better in calculus. Applications are accepted throughout the year. The University of Alabama is regionally accredited by the Southern Association of Colleges and Schools, Commission on Colleges. Yeshiva University ranks #5 on The 50 Best Online Master's in Marketing Programs! One of the nation's premier Jewish schools, Yeshiva University offers an online master's of science in marketing that looks at product promotion through an interdisciplinary lens. This program is offered through a partnership between Yeshiva's graduate and professional studies school and its school of business. This degree track emphasizes analytics and strategy, but the curriculum also teaches students about integrated marketing, branding, social media and viral marketing, digital advertising, location-based techniques, and consumer behavior. The AACSB accredits this program. Yeshiva's online master's degree in marketing revolves around projects, finding real-world solutions to business problems, and portfolio building, Classes are conducted entirely online; distance learners don't need to visit any of the school's four New York campuses. Classes are delivered asynchronously for maximum flexibility, and many students continue to work while they pursue their degrees. Participants can enroll full- or-part time, and ambitious degree candidates can earn the required 30 credits in as little as a year. Students work their way through increasingly complex projects, which mirror the work undertaken by professional marketers, and build a portfolio that they can show to potential employers. The curriculum consists of a total of 10 courses, including a marketing capstone. Successful applicants have come from a wide range of backgrounds, including photography, publishing, history, and video production. Candidates should have a bachelor's degree with a minimum 3.0 GPA and submit their GRE scores, letters of recommendation, and a resume. Yeshiva University is regionally accredited by the Middle States Commission on Higher Education. Pepperdine Graziadio Business School ranks #6 on The 50 Best Online Master's in Marketing Programs! The Pepperdine Graziadio Business School offers an marketing master's degree with a concentration in marketing. Like all of the university's programs, the marketing concentration emphasizes the school's Christian values. The 52-unit curriculum gives students a solid background in business concepts while emphasizing core competencies in ethics, communication, and team dynamics. Aimed at aspiring business professionals with ample work experience, the program leverages and expands a student's previously-acquired knowledge and skills. Marketing is one of five MBA concentrations available online and requires students to complete 12 units. The school operates on a trimester schedule, and most degree candidates finish the program in two years. The program begins as a cohort, but students split off into their chosen concentrations after taking core classes. Participants must maintain a 3.0 GPA while working through the curriculum. Most of the work is delivered asynchronously, but the program requires two residencies, including a workshop in personal and leadership development at the Malibu campus during the first trimester. Billed as a chance to meet cohort members and instructors, and work on team building and management skills, the workshop takes two nights and three days. Pepperdine also requires distance learners to complete an online orientation. Students can accumulate credits during the university's “global business intensive courses,” which are week-long seminars offered between trimesters around the world, in places like Asia, Europe, South America, and the Caribbean. Applicants must submit previous baccalaureate transcripts, GRE or GMAT scores, a resume, and an essay. The school waives the GMAT/GRE requirements for candidates who have three years of management experience. Pepperdine is regionally accredited by the WASC Senior College and University Commission. Michigan State University ranks #7 on The 50 Best Online Master's in Marketing Programs! The online master's degree in marketing at Michigan State University is a hybrid program that specializes in marketing research. Intended for working professionals enrolled on a part-time basis, the master's of science in marketing research follows a 20-month, AACSB-accredited curriculum. Students join cohorts of 25 to 30 individuals where they study under experienced faculty. Michigan State has dozens of corporate partners, including Microsoft, IBM, HP, FedEx, Wendy's, JD Power, Aquent, and Discover, and provides a wide range of networking opportunities. The 34-credit curriculum is delivered predominantly online, although students must visit the campus in East Lansing for two, one-week sessions. Courses during these intensive seminars include communications, marketing research for decision making, consulting, and advanced marketing research. Students must also participate in real-world research and consulting projects with clients. Students graduate with a broad background in leading marketing research techniques, including experimental design, sampling, data collection, and analysis, as well as the technical expertise needed to conduct research projects. The school sponsors regular career fairs, and the class of 2017 had a 100% hiring rate. Michigan State encourages applicants from diverse backgrounds to apply to the program. Applicants must include previous college transcripts, GMAT or GRE scores, a statement of purpose, and letters of recommendation. Michigan State University is regionally accredited by the Higher Learning Commission. University of Cincinnati ranks #8 on The 50 Best Online Master's in Marketing Programs! The University of Cincinnati's MBA program offers an online concentration in marketing that allows degree seekers to earn AACSB-accredited diplomas in as few as 12 months. This program consists of accelerated, seven-week sessions, and incoming students can choose from six start dates per year. The 38-credit program balances the latest in strategic marketing, consumer analysis, and integrated marketing with the core competencies of a strong MBA program, including accounting, economics, finance, leadership, operations, and IT coursework. Students also develop their strategic leadership, decision making, and ethics. Participants pursue coursework entirely online through virtual classrooms, and no visits to Cincinnati are required. Curriculum is split into thirds between core courses, concentration classes, and business fundamentals. The marketing specialty features classes that include marketing strategy for managers, innovation tools, new product development, advertising, and marketing ethics. Additionally, several electives allow participants to customize their degree to meet their career goals. A capstone course is also required. Applicants must have held a “B” average as an undergraduate, but their bachelor's degree can be in any field. However, students with degrees in fields other than business may need to take as many as 10 additional credits. The school waives its GRE/GMAT requirements if candidates have either three years' of work experience and a business degree, seven years' of professional experience, or a terminal degree. University of Cincinnati is regionally accredited by the Higher Learning Commission. Boston University ranks #9 on The 50 Best Online Master's in Marketing Programs! Boston University offer a master's degree in marketing online that has a strong international emphasis. Students in the school's master's of science in global marketing management program interact with degree candidates at some of the world's top business schools. Distance learners have the opportunity to take courses from leading universities in Europe, Asia, and Latin America and join in cohorts and team projects with individuals across the globe. This helps students learn important leadership and logistical skills and develop cross-cultural sensitivities. The program carries accreditation from both the AACSB and the European Foundation for Management Development Program Accreditation System. The 40-credit curriculum integrates the precepts of marketing into a well-rounded business program. Participants gain an understanding of e-commerce, economic analysis, project management, and decision making, while also developing skills in finance, geopolitics, culture, and international relations. Students take 10 required classes and typically finish the program within two years. Ambitious degree candidates can plan their schedule such that they need to add only two extra courses to pick up a specialized graduate certificate in fields that include applied business analytics, corporate finance, data analytics, database management and business intelligence, enterprise risk management, and international finance. Most learning is delivered asynchronously and offered in accelerated, seven-week sessions, although some classes may have real-time components. Online students pay tuition rates that are substantially less than those paid by traditional residential learners. Boston University is regionally accredited by the New England Association of Schools and Colleges (NEASC-CIHE) Commission on Institutions of Higher Education. University of Massachusetts – Lowell ranks #10 on The 50 Best Online Master's in Marketing Programs! UMass Lowell has been an online leader for decades, boasting one of the largest selections of web-based courses of any traditional university. It is also home to an AACSB-accredited MBA program. Distance learners who pursue this master's degree in marketing online build a sturdy base in business theory and the practical, real-world application of those ideas. Students learn the basics of business, including accounting, finance, operations, and organizational behavior. They also cover key marketing principles like sales management, digital marketing, and new product development. The program emphasizes real-world projects in the private, public, and nonprofit sectors to reinforce those skills. The marketing master's degree is offered on a full- or a part-time basis, and students can earn their diplomas entirely online. Participants make their way through 10 to 16 courses, depending on whether they've completed business prerequisites in statistics and microeconomics, and acquire a minimum of 30 credits. Lowell structures the curriculum in three parts: business classes, the MBA core, and three electives in the marketing concentration. Coursework can be undertaken asynchronously on an accelerated schedule, and all materials are available 24/7. Degree candidates can transfer as many as 12 credits into the program from an accredited university, as long as they received a grade of “B” or better. Online students pay in-state tuition at UMass Lowell, regardless of their state of residency. The University of Massachusetts – Lowell is regionally accredited by the New England Association of Schools and Colleges (NEASC-CIHE) Commission on Institutions of Higher Education. University of Massachusetts – Amherst ranks among Top 20 on The 50 Best Online Master's in Marketing Programs! UMass Amherst's online marketing master's is part of the school's MBA program. This AACSB-accredited program emphasizes collaborative learning and real-world experience. It was designed to allow students to continue working while they pursue their degree. Courses run asynchronously, and program participants can enroll on a part-time basis, attending classes at their convenience. A diverse range of professionals pursue degrees at Amherst, including CFOs, entrepreneurs, and small businesspeople. The average student has at least 10 years of professional experience, providing ample networking opportunities between peers. This online master's degree in marketing is available entirely online, but participants also have the option to attend classes in Amherst, Boston, Shrewsbury, or Springfield. Students may take as many as six credits on a trial basis before they officially enroll in the program. Students need to accrue 45 credits to graduate. The marketing focus consists of three courses and teaches students about advertising, communications, branding, and consumer behavior. Students can select from more than a dozen electives to fulfill their concentration requirements, including courses in digital business models, sales promotion, social media strategy, web analytics, and e-commerce. The school partners with United Technologies, Yankee Candle, Pfizer, Caesars Entertainment, and many other companies, giving students the opportunity to use the skills they've acquired in class in a real-world setting. Program perquisites include accounting and finance coursework. Applicants must send in their transcripts, GMAT or GRE scores, two letters of recommendation, and a resume. Online students pay in-state tuition, no matter where they live. The University of Massachusetts – Amherst is regionally accredited by the New England Association of Schools and Colleges (NEASC-CIHE) Commission on Institutions of Higher Education. Liberty University ranks among Top 20 on The 50 Best Online Master's in Marketing Programs! Liberty's master's of science in marketing follows a 36-credit curriculum, and participants select from three classes in their area of concentration. A capstone project concludes the program. Students must pass all of their classes with a “C” or higher. Educators deliver coursework asynchronously. Typical students earn their degrees in four semesters (two years), but Liberty allows distance learners to take as many as five years to graduate. Liberty allows students to transfer up to half of their credits into the program from an approved college or university. The school also awards credit for work experience through its college level examination program. Fees are higher for online students than they are for on-campus students. Prerequisites include 27 credits in an undergrad business program, including an ethics class. Nova Southeastern University ranks among Top 20 on The 50 Best Online Master's in Marketing Programs! Nova Southeastern University offers an online master's degree in marketing as part of its MBA program. The marketing concentration develops skills in advertising, digital media, sales, and promotion, which are needed in any corporate or small-business environment. This Fort Lauderdale university boasts an experienced faculty, internship agreements with major corporations, and a wide network of contacts. Participants are typically working professionals who see the 18-month program as a way to advance their careers. Nova's master's degree in business with a marketing concentration totals 39 credits, 21 of which are MBA core classes like accounting, strategy for managers, information systems and data management, and organizational behavior. The program devotes the remainder of the curriculum to marketing, and students have the option of undertaking an internship. Nova partners with several major corporations, including DHL, Target, and Sawgrass Mills Shopping Mall, providing students with opportunities for hands-on experience. The program has five start dates each year for added flexibility – August, October, January, March, and May – and the university schedules classes in accelerated, eight-week sessions. Most courses run asynchronously. Applicants should have taken finance, statistics, and accounting coursework at the baccalaureate level or be prepared to add those classes to their MBA course load. The school allows distance learners to transfer in as many as six credits. Nova Southeastern University is regionally accredited by the Southern Association of Colleges and Schools Commission on Colleges. The University of Texas at Dallas ranks among Top 20 on The 50 Best Online Master's in Marketing Programs! One of the biggest advantages of UTD's online marketing master's degree is the sheer number of classes available in its curriculum. Unlike many other programs, this MS in marketing allocates the majority of classes required for graduation to actual marketing coursework. Of the 12 required classes, 11 are in marketing. This gives students in the AACSB-accredited program an incredibly in-depth marketing education. The program emphasizes marketing management skills; quantitative skills in areas like statistics, market research, and database analysis; and qualitative thinking in areas like consumer behavior. Students can complete the 36-credit curriculum entirely online. Both the local chapters of the America Marketing Association and the American Advertising Federation provide input to the direction of the program, helping keep the curriculum up to date. The program features recorded lectures, allowing students to log on and complete their coursework at any time. Most participants earn their degrees within two years, and especially motivated students can finish in a single year. Distance participants may need to have some exams proctored. Students from any background are welcome to apply, and the program has no specific prerequisites. The program skews younger than most; the average age of the most recent cohort was 23 and the average work experience 1.7 years. UTD also has a double MBA/MS in marketing program that consists of 63 credits. Applicants may transfer in as many as nine credits from an approved university. The University of Texas at Dallas is regionally accredited by the Southern Association of Colleges and Schools Commission on Colleges. Temple University ranks among Top 20 on The 50 Best Online Master's in Marketing Programs! Temple University places the focus of its online marketing master's program in the digital arena. This Philadelphia institution developed its new MS digital innovation in marketing degree with input from its department of marketing and supply chain management and department of management information systems. Intended for working professionals, the curriculum focuses on the latest developments in digital information technology. Coursework includes subjects like IT management, data analytics, digital business innovation, user experience design, and brand management. The program culminates in a capstone project. The 30-credit program consists of nine courses. Part-time students can earn their degree in 16 months by enrolling in two courses per semester, which meet on alternating weeks. Everything is conducted online, but the program requires a high level of engagement. Each course meets for seven “learnathons,” which are three-hour sessions on the same weeknight, and six online “meetups,” which are one-hour quick classes. Students do the remainder of work asynchronously. Many classes feature guests or instructors from Temple's advisory council, which includes representatives from major corporations like Warby Parker, Citi, LinkedIn, Cigna, and Johnson & Johnson. Applicants must submit baccalaureate transcripts, letters of recommendation, a current professional resume, an essay, and GMAT or GRE scores, although the university waives its test score requirements for candidates with 10 or more years of experience. A marketing background may be helpful, and many students have experience in journalism, communications, or public relations. Temple's business school has carried AACSB accreditation since 1934. 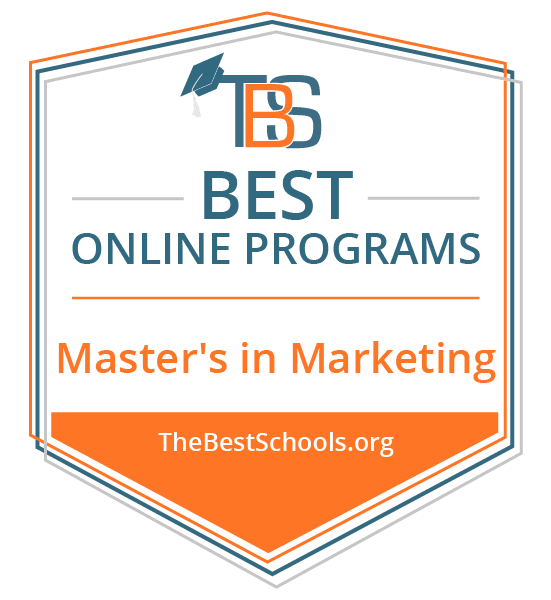 Dallas Baptist University ranks among Top 20 on The 50 Best Online Master's in Marketing Programs! Dallas Baptist University is a major force in Christian online learning, and the school has a busy virtual campus where students can earn associate, bachelor's, master's, and doctoral degrees, as well as graduate certificates. DBU's online MBA program is among the school's most popular, teaching students the importance of analytical and problem-solving skills, creative leadership, relationships with customers, messaging and sales, and Christian ethics. Marketing is one of 10 concentrations within the MBA program. Students have the option of pursuing more than one concentration (by taking 12 more credits) or adding a second major in leadership and communications. Participants can also add graduate certificates in a variety of fields. Individuals pursuing DBU's marketing master's degree online complete 36 credits, focusing on the role of traditional marketing in the global economy. Classes includes coursework in formulating and implementing promotional strategy, managing distribution channels, buyer behavior, and integrated marketing communications. Students can complete all classes online at their convenience – no specific log-in times required. MBA core courses, including accounting, finance, decision making, and problem solving, comprise two-thirds of the curriculum. The final third is concentration-related, with three required classes and an elective. Two of the required MBA courses involve field-based service learning. Dallas Baptist University is regionally accredited by the Southern Association of Colleges and Schools Commission on Colleges. University of North Texas ranks among Top 20 on The 50 Best Online Master's in Marketing Programs! Based in the city of Denton, the University of North Texas hosts more than 25 degree programs on its virtual campus, including a marketing master's degree. Offered as part of the MBA program, the marketing degree track is well-suited for future managers and executives. It provides a solid base in business, with several classes in management, leadership, decision making, and problem solving, as well as a foundation in the basics of marketing. The school designed the program to accommodate the schedules of working individuals, and students can enroll on a part-time or full-time basis. Students complete 36 credits, which are broken down into MBA core courses (18 credits), required marketing classes (six credits), supporting courses (nine credits), and one elective course (three credits). Degree candidates select from a handful of marketing classes, such as marketing research and IT, marketing tools and skills, and advanced marketing management. Supporting courses include sales and distribution, logistics, advertising, and entrepreneurship. Students who don't have undergraduate business degrees may need to enroll in additional business prerequisites in areas like statistics, economics, and calculus. Program participants can access coursework anytime, and no visits to the main campus are required. The schedule of classes rotates frequently, making it easy to complete required coursework. High-achieving students are eligible for membership in the prestigious Mu Kappa Tau group, which is the National Honor Society for marketing. Applicants to UNT must submit their previous collegiate transcripts and GRE or GMAT scores. Non-resident online tuition is only slightly higher than resident online tuition. Saint Joseph's University ranks among Top 20 on The 50 Best Online Master's in Marketing Programs! Not to be confused with the Catholic school of the same name, Saint Joseph's University is a Jesuit college outside of Philadelphia. St. Joe's school of business offers a master's of marketing online degree with specializations in either international marketing or consumer analytics. Students in this AACSB-accredited master's of science in marketing program receive a thorough education about the fundamentals of marketing, including research, strategy, and brand development, before moving into their area of concentration. Because of the school's deep Jesuit traditions, ethics factor into every aspect of the program. Coursework is delivered both asynchronously and in real-time weekly meetings, giving students the opportunity to interact and network with their peers and professors. Classes might feature lecturers, group projects, or live case studies, and program participants can enroll full- or part-time and progress at their own pace. Classes run in accelerated, eight-week sessions, and students typical earn their degree in 1.5 or two years. Each specialization consists of 10 courses (30 credits). The international marketing track culminates in a study tour that takes students to various areas around the world for immersion in a different region's culture, trends, and market potential. The university allows students to pursue a second major, such as business administration, financial services, or business analytics. St. Joe's marketing degree has no prerequisites, and the program welcomes applications from candidates of all academic backgrounds. Applicants should have a bachelor's degree from an accredited university and submit their GRE or GMAT scores, two letters of recommendation, and a personal statement. Saint Joseph's University is regionally accredited by the Middle States Commission on Higher Education. Saint Mary's University of Minnesota ranks among Top 20 on The 50 Best Online Master's in Marketing Programs! Located in Minneapolis, St. Mary's University of Minnesota offers a master's degree online in marketing with a specialty in social media management. Maximizing the use of internet platforms like Facebook, Instagram, and Twitter is key to any modern marketing effort, and developing these skills is at the heart of St. Mary's program. The social media concentration is part of the university's broader MBA program; in addition to learning how to market effectively, students pursuing this degree develop skills in management and administration. Students in St. Mary's online MBA program develop expertise in the types of digital storytelling that drive social media and product sales. Courses explore brand management, building consumer connections, and social marketing ethics. St. Mary's partners with the National Institute for Social Media, and degree candidates prepare for the institute's social media strategist certification exam. Students also take a special-topics course in a subject of their choosing (options include international development, finance, management, accounting, and IT, among 20 others), and complete an experiential capstone project. All St. Mary's online graduate students receive an iPad preloaded with the school's mobile learning platform. Faculty members schedule work asynchronously in accelerated, eight-week courses, allowing participants to earn their degrees in as little as 18 months. St. Mary's has a rolling admission policy, and students can begin the program at the start of any semester. Applicants must have kept a 2.75 GPA or better while earning their undergraduate degrees, although provisional acceptance is possible for those who fail to meet this requirement. Students may transfer in a maximum of six credits. Saint Mary's University of Minnesota is regionally accredited by the Higher Learning Commission. Indiana University – Bloomington ranks among Top 20 on The 50 Best Online Master's in Marketing Programs! The MS in marketing at Indiana University-Bloomington is a comprehensive program that gives students a thorough education in the precepts of marketing, including the uses of social media, data mining, and consumer analysis. Graduates leave this 30-credit program prepared to perform quantitative analysis, conduct consumer research, create branding profiles, and implement marketing strategies in the global marketplace. They also learn about the finer points of social media and digital marketing and know how to manage campaigns. IU's business school designed its programming for working professionals, and students can earn their diplomas in as few as 15 months through a variety of flexible formats. (Distance learners have up to five years to earn their degrees.) Students learn through web-based meetings, discussion forums, simulations, interactive classes, and hands-on experiences in the field. Program participants can enroll in experiential learning electives, where they can travel overseas, or complete everything online. Students have the option to attend live lectures or watch recordings at their convenience. Students can also double up and add an MBA to their MS degree by completing a total of 63 credits. Students must have accounting skills before they begin the MS in marketing program, and the school offers a primer for those who didn't take accounting classes as an undergraduate. Applicants must submit transcripts, GRE or GMAT scores, and sit for an interview. Indiana University – Bloomington is regionally accredited by the Higher Learning Commission. New Jersey Institute of Technology ranks among Top 25 on The 50 Best Online Master's in Marketing Programs! The curriculum of the online MBA program at the New Jersey Institute of Technology in Newark is decidedly forward-thinking, putting tech at the forefront of its business classes. NJIT sees technology as the strategic link between innovation and management, and its MBA, which features a strong marketing concentration, is digitally oriented. The program teaches students to use information systems for decision making and problem solving, leveraging technology and managing innovation. The AACSB provides accreditation for this program. NJIT's digital marketing master's degree consists of 16 courses and totals 48 credits. Students typically take two classes per semester. Course content is delivered asynchronously, allowing participants to work at their own pace; however, classes are also media-rich and create an interactive environment for students and instructors. Degree candidates receive a strong foundation in contemporary marketing techniques. Classes cover the basics of marketing, from planning to execution, brand building, customer-relations management, adding value for stakeholders, market research and analysis, and measures of marketing success. The institute also offers two graduate certificates that complement its MBA program: management essentials and management of technology. NJIT gives online students pay the same tuition as New Jersey residents. Additionally, graduate students may take up to nine credits prior to officially matriculating into the program. New Jersey Institute of Technology is regionally accredited by the Middle States Commission on Higher Education. Brandman University ranks among Top 25 on The 50 Best Online Master's in Marketing Programs! A nonprofit institution based in Irvine, California, Brandman provides educational opportunities to working adults. The school's web-based courses run year round on an asynchronous basis, allowing professionals to log in and earn their degrees at their convenience. Among its many online offerings is the school's MBA program, which has a marketing concentration. The curriculum of Brandman's online master's in marketing covers promotion, advertising, and consumer behavior from both technological and psychological points of view. Students at Brandman take 36 credits of core classes in areas like data analysis for decision making, corporate responsibility, leadership and innovation, and organizational dynamics. Distance learners then complete a required business strategy and competitive advantage capstone. Students add four classes in the marketing specialization to these fundamentals: international marketing, marketing research, new product development, and advertising and promotion. Applicants must have maintained a 3.0 GPA over their final 30 undergraduate credits or posted a 2.5 GPA with exceptional GRE or GMAT scores. These requirements can be waived if a student has a master's or terminal degree or a work portfolio that proves their abilities. Brandman prides itself on affordability; tuition is the same for all online learners, with the exception of active-duty military and their spouses (who enjoy large discounts). Online students can often test out of classes using the university's competency-based testing program. Brandman University is regionally accredited by the Western Association of Schools & Colleges. Concordia University – Wisconsin ranks among Top 25 on The 50 Best Online Master's in Marketing Programs! Concordia University-Wisconsin's online marketing master's degree focuses on leadership and strategy. The 39-credit program is well-suited for individuals in advertising, sales, or promotion, teaching students about direct, international, and social marketing. The Mequon-area school offers this degree as part of its MBA program, which has 15 concentrations available. Participants come from all over the world, with more than 40% of the MBA student body consisting of international students. CUW is part of the Concordia system, which includes 10 Lutheran Church Missouri Synod-affiliated universities across the country. The International Accreditation Council for Business Education provides accreditation for CUW's business school. The program delivers coursework asynchronously, although classes tend to encourage a great deal of participation and interaction. As opposed to textbooks, many professors rely on recent case studies, articles, and practical lessons. Students work their way through nine required MBA classes and then take 15 marketing credits, selecting from classes like strategic marketing, advertising management, marketing research, and sponsorship, sales, and fundraising strategies. Students must also complete an internship, adding 120 hours of work experience to their portfolio. CUW's Christian beliefs infiltrate coursework, and several classes delve into religion and ethics. This program does not require a thesis. Applicants must submit transcripts from their baccalaureate degree (with a minimum 3.0 GPA), an essay, two letters of recommendation, and a resume; however, graduate entrance exam scores are not required. The school uses rolling start dates, allowing accepted students to begin their education at any time. Additionally, some degree candidates can test out of classes by taking advantage of the college level examination program. Concordia University – Wisconsin is regionally accredited by the Middle States Commission on Higher Education. Southern New Hampshire University ranks among Top 25 on The 50 Best Online Master's in Marketing Programs! Students at Southern New Hampshire University can earn a marketing master's online in a little over a year by taking just two courses a semester. An extension of the school's 40-year-old MBA program, the marketing track was set up to educate working professionals. The curriculum touches on promotional campaign management, consumer behavior, customer satisfaction analysis, brand building, and effective communication, while also giving students a foundation in traditional business skills. The Accreditation Council for Business Schools and Programs gives this program its seal of approval. An added benefit of the program is the vast networking potential; graduates have gone on to work at many major corporations, including Pfizer, Liberty Mutual, Fidelity, Verizon, United Healthcare, and Oracle. SNHU set up its virtual campus to provide students with maximum flexibility; participants pursuing the school's online MBA in marketing can move at their own pace and take as many classes per semester as they can handle. Participants can enroll in five graduate terms throughout the year, allowing them to move through the program quickly. The curriculum consists of nine MBA core courses and three marketing electives in promotions management, brand management, and consumer behavior and marketing. Degree candidates may have to take extra classes if they missed requisites in the areas of statistics and finance at the undergraduate level. A capstone project completes the program. Online students enjoy reduced tuition compared to their on-campus peers. SNHU does not require applicants to submit GRE or GMAT scores; the application process is quick and relatively easy, including only transcripts and a conversation with an admissions counselor. Most prospective students find out whether they've been accepted within days of submitting their application. Southern New Hampshire University is regionally accredited by the New England Association of Schools and Colleges (NEASC-CIHE) Commission on Institutions of Higher Education. Lewis University ranks among Top 25 on The 50 Best Online Master's in Marketing Programs! Located in Romeoville, Illinois, Lewis University offers an online master's in marketing as an offshoot of its data analytics program. At its core, the 33-credit curriculum at Lewis teaches students how to leverage research and intelligence to make strategic and profitable decisions. The program is a blend of IT and business, incorporating such subjects as decision trees, search algorithms, clustering, segmentation, analysis, and optimization concepts for data. It's designed for working professionals, offering small and interactive classes, asynchronous scheduling, and accelerated, eight-week sessions. Everything is available online, with no required campus visits. The program allows participants to connect to the university's virtual machines and conduct experiential exercises with data mining tools like RapidAnalytics, Weka, MySql, InstantAtlas, and DyGraphs. Future marketers learn how to optimize return on investment by planning and executing data-driven ad campaigns. The curriculum consists of seven core courses in data analytics, a capstone course, and three classes in marketing: marketing management, marketing research, and social media analytics. Students who did not take business fundamentals during their undergraduate career need to add an additional three credits. Candidates for the program must have a bachelor's degree from an accredited university with a GPA of 3.0 or better. They must also submit a resume and two recommendations. Lewis doesn't require graduate entrance exam scores. The university charges a flat rate to all students in this program. Walsh College ranks among The 50 Best Online Master's in Marketing Programs! Walsh College is the only school in Michigan to offer a master's of science in marketing, and it does so through a hybrid program. Students must earn at least 21 credits in the 33-credit program while in residence. Based in the city of Troy, Walsh has been a standout business college for almost 100 years, and it offers an array of options to future marketers. Students can complete a professional internship or a consulting project, or they can add 27 credits and take home an MBA with their master's in marketing. Most MBA classes are also available online. The marketing program itself blends theory and practice, emphasizing human behavior and determining why consumers make the choices they do. The Accreditation Council for Business Schools and Programs has given business courses at Walsh its approval. The master's in marketing program at Walsh consists of 11 core classes and a capstone experience. The degree prepares graduates to create and manage a brand, market effectively and ethically, and develop PR strategies using the latest digital tools. Walsh prioritizes communication and leadership skills, helping program participants feel comfortable at the head of a team. Classes explore such subjects as information technology, public relations strategies, marketing fundamentals, consumer behavior, and consumer insights. Most online coursework is delivered asynchronously. Applicants must have a bachelor's from an accredited university with a minimum 2.75 GPA, although candidates with a GPA of at least 2.0 may enter on a provisional basis. Walsh does not require applicants to submit graduate entrance exam scores. Upon matriculating, enrollees need to take a graduate communication assessment exam to measure their writing skills. The college charges a flat-rate fee for graduate tuition. Fordham University ranks among The 50 Best Online Master's in Marketing Programs! Fordham University designed its online master's of marketing and communication program to help working professionals. This New York Jesuit university develops students' existing abilities in areas that include marketing, advertising, and business communications using the newest industry tools. Program participants learn about social media, advertising and promotion, and consumer behavior. Students are also encouraged to bring in business challenges they're facing at work and come up with solutions with their network of peers. The school delivers most of the 33-credit program through virtual classrooms, which are usually taught asynchronously. However, students and faculty do meet for two residencies, which bookend the program, in New York City. Fordham's business school has many marketing and media partners, and students in the master's of strategic marketing and communication program can build their networks as they visit MediaCom, Ad Club of New York, Ketchum PR, and other leading agencies during their residencies. The curriculum combines coursework from the marketing and communications departments, and degree candidates take five classes from each. Distance learners also carry out an applied project to cap off their studies. Graduates have access to a network of 37,000 business school alumni. Applicants must have professional experience in the media, advertising, entertainment, marketing, or public relations fields. Prospective students can submit applications during four rounds of admission. Fordham's business school has a flat tuition rate for students in its master's of science programs. Fordham University is regionally accredited by the Higher Learning Commission. Golden Gate University – San Francisco ranks among The 50 Best Online Master's in Marketing Programs! Golden Gate University offers an online master's in marketing that lets students choose between two tracks: general marketing or digital marketing. Whichever direction they choose, program participants learn about marketing research and strategy, brand positioning, budgeting, and integrated marketing communication. Golden Gate's mission is to educate adults and nontraditional students, and the university embraces flexible scheduling to accommodate working people. The 33-credit curriculum of this program is split into two main parts; students take five classes of core courses and five more in their area of concentration. They also get to take one additional elective course. The general marketing track provides a broad overview of the field, while the digital marketing track concentrates on e-commerce, social media, search engine marketing, and data analytics. Within the specialization, learners take three required classes and two concentration-related electives to better tailor the program to their career goals. Golden Gate delivers content in a variety of ways, but most coursework is provided asynchronously. Students typically earn their degrees within two years. Students must have adequate writing, math, and business skills to enter this program. Distant learners pursuing this online marketing master's degree must have also completed certain foundational courses in accounting, economics, financial analysis, and data analysis. Students can test out of these classes using the college level examination program, and they can enroll in 12 credits of marketing courses before completing all of these prerequisites. Students who demonstrated excellent academic achievement at the undergraduate level can have their GMAT or GRE requirements waived. Golden Gate University – San Francisco is regionally accredited by the WASC Senior College and University Commission. West Texas A&M University ranks among The 50 Best Online Master's in Marketing Programs! Located in the city of Canyon, West Texas A&M University offers an online MBA with a marketing concentration. This program carries accreditation from the AACSB and can be completed entirely online. Distance learners typically finish the program in two years, but motivated students can earn their diplomas in as little as a year. The core curriculum of this MBA in marketing is heavily weighted toward management and business acumen, featuring classes like leadership, organizational behavior, strategic management, and accounting for decision making; however, students can use several marketing courses to fulfill core requirements. The marketing concentration itself consists of three classes. The school delivers most of its coursework asynchronously, although some classes may have some real-time components. Students construct an MBA portfolio as part of their final capstone project, which emphasizes their skills in written and oral communication, leadership, ethics, global business, decision making, and strategic planning. The university has four terms each year. This program is competitive and applicants must show competency in foundational business courses. The GMAT is not necessary if students posted a GPA of at least 3.0 during their undergraduate years. West Texas A&M offers an online orientation class to help distance students become comfortable with their new cyber classrooms. Most non-residents pay only slightly more than Texans for tuition. West Texas A&M University is regionally accredited by the Southern Association of Colleges and Schools Commission on Colleges. Texas A&M University – Commerce ranks among The 50 Best Online Master's in Marketing Programs! Texas A&M University in Commerce opens its graduate-level online master's in marketing to anyone, regardless of their academic background. While best-suited for students from baccalaureate business programs, the 30-credit master's of science in marketing is available to art grads and accountants alike. The program emphasizes both practical knowledge and applied theory, and graduates leave with a firm grasp of marketing management, marketing research, business-to-business (B2B) marketing, and international marketing. Individuals are prepared for upper-level positions in marketing agencies or for further study in doctoral programs. Because TAMUC's marketing master's degree is offered through the school's department of business administration, students take several classes in finance, management, organizational behavior, and applied business research. The marketing component includes coursework in small business marketing, advertising and promotion, and internet-based marketing. Participants who come to the program from non-business backgrounds also need to take three courses in finance, operations, and the marketing environment. Students can further customize their degree with two elective classes. TAMUC has offered online business programming since 1995, and distance learners can now earn their degrees entirely in cyber classrooms. Professors schedule most coursework asynchronously, and students typically move through the program within two years. Applicants must have a 3.0 overall undergraduate GPA (or a 3.25 over their last 60 hours) and provide transcripts, GRE or GMAT scores, and a letter of recommendation. Texas A&M University – Commerce is regionally accredited by the Southern Association of Colleges and Schools Commission on Colleges. University of Saint Mary ranks among The 50 Best Online Master's in Marketing Programs! Based in Leavenworth, Kansas, the University of Saint Mary hosts an online MBA program with a marketing concentration that is designed to be completed in a single year. The program endeavors to help students become executives who can take charge of a marketing or advertising team, create a successful campaign, and manage its execution. Students accrue 36 credits while earning their diplomas, taking nine core business courses and three required classes in marketing (i.e., the advertising industry in the 21st century, buyer behavior and marketing research, and advanced marketing strategy planning). The International Assembly for Collegiate Business Education accredits the program, and St. Mary embraces its Catholic values throughout the curriculum. USM's online master's degree in marketing is a business administration program, and graduates emerge with a solid business foundation. Most of the required classes in the MBA core have a management slant (e.g., marketing management, organizational management, and managerial economics). The university schedules classes asynchronously in accelerated, eight-week sessions and has six start dates each year. Program participants should expect to spend roughly 15 to 20 hours per week on their coursework. This program requires no visits to campus, and students can pursue all of their credits online. Applicants must have maintained a 2.75 GPA while earning their bachelor's degrees. Online learners at St. Mary pay the same tuition as on-campus master's candidates. University of Saint Mary is regionally accredited by the Higher Learning Commission. DeSales University ranks among The 50 Best Online Master's in Marketing Programs! One of the top-ranked MBA programs in Pennsylvania, DeSales' master's of business administration is a 36-credit degree that was designed to for part-time students. The MBA program of this Center Valley university is oriented toward general management and executive skills, linking theory with practical application. Marketing is one of 11 possible areas of concentration in this Catholic university's MBA program. Classes are available online in a largely asynchronous format, and the coursework schedule is flexible to accommodate the lives of busy professionals. Students at DeSales take a total of 12 classes as they make their way through the online marketing master's program: seven core courses, three in marketing, one elective, and a capstone in policy and strategy. Distance learners generally take a single course per term and make their way through the program in three years. The school offers three 12-week sessions and one six-week summer term per year. Degree seekers also have the opportunity to test out of some requirements, but they must still pay 30% of the fees for those courses. DeSales welcomes applications from students from any academic background, although some individuals may need to take additional foundational courses. Candidates must have a baccalaureate degree from an accredited university, acceptable GMAT scores, and/or significant work experience. The school has three annual start dates. The Accreditation Council for Business Schools and Programs provides accreditation for DeSales' business school. DeSales University is regionally accredited by the Middle States Commission on Higher Education. La Salle University ranks among The 50 Best Online Master's in Marketing Programs! A Catholic university in Philadelphia, La Salle offers an online master's in marketing that is part of the school's MBA degree. The marketing program features accelerated, eight-week sessions with five start dates throughout the year. Most individuals graduate within two years, pursuing the curriculum entirely online in an asynchronous format. No residencies or immersions are required. La Salle developed its online MBA with a marketing specialization to prepare students to be leaders who can solve problems and make decisions, while also creating and managing compelling marketing campaigns. Accredited by the AACSB, the program revolves around core courses in accounting, marketing, finance, business analytics, and leadership and decision making. Students in the marketing track add three more classes in consumer behavior, strategic marketing intelligence, and special topics in marketing. The capstone course – competitive strategy – explores the tactics businesses use to succeed; participants take this at the end of the program. Applicants must submit their collegiate transcripts, GMAT or GRE scores, and a professional resume of their work experience. La Salle may waive entrance exam scores if a student had an undergraduate GPA of 3.0 or better and has at least two years of business experience. Candidates without a background in business need to add at least six credits of foundational work. Students from outside Pennsylvania pay the same all-inclusive tuition as in-state residents. La Salle University is regionally accredited by the Middle States Commission on Higher Education. Saint Bonaventure University ranks among The 50 Best Online Master's in Marketing Programs! Saint Bonaventure University may be best known for its business programs. The small Franciscan Catholic university takes its name from the upstate New York community where it is located, and it's one of the smallest schools to receive AACSB accreditation. St. Bonaventure offers five online business degrees, including an MBA with a marketing concentration and a master's in integrated marketing communications. The MBA program prepares students for leadership positions, with an edge in marketing, while the IMC degree readies graduates to join the world of promotion and advertising. The MBA with a specialization in marketing consists of 39 credits and emphasizes traditional business skills in areas like accounting, operations, finance, and marketing. The concentration adds classes in marketing research, international marketing, and consumer behavior. Students also complete a comprehensive, case-based capstone course where individuals work together to solve a business problem. The IMC degree has a similar structure and concludes with a project where participants create an integrated marketing campaign for an organization. Graduates leave both programs with a professional e-portfolio. St. Bonaventure offers both programs entirely online in accelerated, seven-week sessions. The MBA typically takes 20 months or less to complete, and the IMC degree can be finished in a single year by taking just two courses per term. All classes run asynchronously, and each distance learner is assigned a student success advisor. Technical support is available 24/7. Students who earned their undergrad degree with a 3.3 GPA, or kept a 3.0 GPA and have two years of work experience, do not need to take an entrance exam. Saint Bonaventure University is regionally accredited by the Middle States Commission on Higher Education. University of Redlands ranks among The 50 Best Online Master's in Marketing Programs! The University of Redlands' online marketing master's program provides students with a strong background in business as well as an expertise in the field of advertising and promotion. This small, liberal arts school is located in California and offers a web-based MBA with a concentration in marketing. Degree seekers in the program tend to be nontraditional students; for example, almost two-thirds of participants are parents. Thus, the program is flexible and allows students to earn their diplomas in two years or less by taking courses in accelerated, eight-week sessions. Individuals can begin on one of six start dates throughout the year. Most classes are delivered asynchronously and distance learners complete coursework at their convenience. The 48-credit course of study takes a customer-based approach. Coursework is divided into four sections: 12 credits of business classes, 16 credits in the MBA core, 16 credits in the marketing concentration, and four final credits in the form of a capstone project where students use strategic analysis to gain insights into different markets and design their own marketing plan to demonstrate an understanding of advertising principles. The four classes that comprise the marketing specialty include marketing analytics, management, strategy, and global promotion. Applicants must submit their college transcripts, a resume, and letters of recommendation. Redlands also considers graduate exam scores in their admissions process. The University of Redlands is regionally accredited by the WASC Senior College and University Commission. Walsh University ranks among The 50 Best Online Master's in Marketing Programs! Walsh University follows a tech-oriented approach in its online master's degree in marketing program. The marketing degree of this Catholic institution is part of its MBA program and gives students the opportunity to enroll online or on campus in North Canton, Ohio. The 36-credit curriculum blends traditional market practices with the latest trends in e-commerce, social media, and digital advertising. Graduates are ready to assume leadership roles at marketing companies, PR firms, advertising agencies, or in corporate ad divisions. For an MBA-based degree, this program includes a heavy dose of marketing coursework. Students must work through seven required MBA classes (one of which is in marketing) and then complete five classes in their specialty, including marketing research, social media marketing, analytics, integrated marketing communications, and services marketing. Distance learners finish the program by completing a strategic marketing capstone project. Degree candidates must also take a course in ethics as part of the MBA core; this class emphasizes Walsh's Catholic traditions. This program features 100% online content, and most graduates can complete their studies in as little as one year. Alternatively, students who take a single course per semester can graduate in 2.5 years. The university offers six start dates annually. Admission is based on an applicant's previous academic performance and resume, and candidates must have kept a cumulative GPA of 3.0 or higher at the undergraduate level. Online learners pay the same tuition rate as on-campus students. Walsh University is regionally accredited by the Higher Learning Commission. University of South Dakota ranks among The 50 Best Online Master's in Marketing Programs! The flagship public university in the state, the University of South Dakota currently hosts more than 40 web-based programs, including an MBA with a marketing specialization. USD's AACSB-accredited program prepares students to become leaders in business, industry, and government. Learners are also readied to pursue doctoral study. Participants network with business leaders and develop problem-solving abilities, communications skills, and management talents. The marketing concentration emphasizes consumer behavior, new product development, branding, creativity, and strategic marketing. Individuals with a background in business receive advanced standing in the program, and they can earn their degrees by completing just 36 credits. Students who entire this online marketing MBA program from other fields need to add as many as 18 credits in foundational studies. The core curriculum includes 27 hours of upper-level business classes that focus on leadership development and organizational management. The marketing specialization itself features nine hours of coursework in data mining, product development, brand management, and advanced consumer behavior. Participants also complete a special project in an area of their choice. One class – leadership development – requires students to pay a visit to the school's campus in the city of Vermillion for a five-day residency. This seminar can be attended in either April or July, giving online learners the chance to meet their faculty and peers and engage in face-to-face networking. USD hosts all other coursework in its virtual classrooms, and most classes run asynchronously. Online learners pay in-state tuition. The University of South Dakota is regionally accredited by the Higher Learning Commission. Florida Institute of Technology ranks among The 50 Best Online Master's in Marketing Programs! The Florida Institute of Technology offers an MBA with a concentration in marketing. This degree can be completed entirely online. Offered through FIT's college of business, the program carries accreditation from the International Assembly for Collegiate Business Education. Candidates from any academic background are welcome to apply. The curriculum takes a case method-based approach, and students work collaboratively in an experiential environment that uses chat rooms, discussion forums, interactive media, and video segments. Students pursuing this master's degree in marketing online complete 36 credits, 21 of which are core MBA courses. These classes cover traditional subjects, such as accounting, finance, management, leadership, and economics, as well as management information systems coursework. A class in strategic marketing is also part of the core. Four additional classes in marketing, including strategic marketing, consumer behavior strategies, advanced market research, and international business, form the concentration core. Participants also complete a required capstone in strategic marketing during their final semester where they build a competitive advantage for their “company” by using effective marketing, putting their newfound skills into practice. The institute hosts all classes asynchronously in accelerated, eight-week sessions. FIT does not require applicants to submit their GMAT scores, although the school does give scholarship preference to students who scored well on the exam. Degree candidates who have not taken essentials of business development courses need to do so. The Florida Institute of Technology is regionally accredited by the Southern Association of Colleges and Schools Commission on Colleges. University of Maryland – University College ranks among The 50 Best Online Master's in Marketing Programs! The University of Maryland's University College has been educating professionals and nontraditional students for more than 65 years. Part of the public university system of Maryland, UMUC has 21 locations throughout Maryland, the District of Columbia, and Virginia. However, the school offers most of its degrees online. UMUC hosts its online classes asynchronously, allowing working professionals to complete coursework at their convenience. Unlike many other programs, this management degree in marketing is not an MBA; instead, it is a strategically targeted marketing master's degree that combines good marketing practices with a strong business framework. The 36-credit curriculum of the management master's degree with a marketing specialization at UMUC features coursework that is heavily weighted toward marketing, with the specialization comprising two-thirds of the required credits. Students must maintain a 3.0 GPA as they pursue their degrees. Subjects include marketing legal and ethical issues, consumer behavior, marketing research systems, integrated marketing communications, and international marketing. Degree candidates must complete 24 credits and all core classes before enrolling in the required capstone course in strategic management. UMUC recommends its program to current marketers looking to move ahead in the field, new marketing professionals, and people interested in changing careers. Students have up to five years to earn their degrees, but most finish the program in two years. The university allows students to transfer in as many as six credits. UMUC also offers a management degree in public relations online. The University of Maryland – University College is regionally accredited by the Middle States Commission on Higher Education. Rivier University ranks among The 50 Best Online Master's in Marketing Programs! A Catholic university in Nashua, New Hampshire, Rivier University is a leader in online education. Through RivierOnline, the school hosts almost two dozen web-based degrees, most of them in the fields of business, IT, and healthcare. This liberal arts university offers an MBA with an online concentration in marketing that emphasizes business and management, providing students with a thorough education in leadership and business fundamentals, such as finance, strategy, organizational dynamics, and risk and project management. The concentration itself accounts for nine of the required 36 credits and consists of three classes: digital marketing and analytics, sales management, and strategic brand management. A class in marketing and new product development is also included as part of the core curriculum. Coursework in the online master's in marketing is scheduled asynchronously across accelerated, seven-week sessions. Most students complete the program in two years or less. Participants can attend all classes online without ever visiting campus. Rivier has a rolling admissions policy, and prospective candidates can apply at any time. Applicants should provide a resume and undergraduate transcripts (with a GPA of 3.0 or better), although the university may consider applications with a lower GPA on a provisional basis. Tuition is the same for all graduate students, whether they attend classes on campus or online. Up to nine credits may be transferred into the program. The New England Association of Schools and Colleges provides accreditation to Rivier. Rivier University is regionally accredited by the New England Association of Schools and Colleges. Wilmington University ranks among The 50 Best Online Master's in Marketing Programs! The online marketing master's at Wilmington University is a part of the Delaware institution's MBA program; it was established to ready business professionals for leadership roles. The 36-credit curriculum prioritizes the development of executive skills, including quantitative and qualitative analysis, strategy, and communication, while also providing a well-rounded background in business. It actively fosters an “appreciation for the role of business in a pluralistic society,” and features many classes in global business. Core classes teach students about the issues facing global marketing management and prepare them to create a marketing plan to meet sales goals and customer needs. The International Assembly for Collegiate Business Education accredits this program. The curriculum for this online marketing management program is delivered asynchronously in seven-week sessions, allowing students to study at their own pace. Program participants complete seven core classes in business fundamentals as well as five classes in the marketing management concentration. Wilmington expects students to log on three to five times per week for each class, but they can do so at their convenience. The recommended degree plan begins with organizational behavior and ethical leadership classes. Students must pass four courses with a minimum 3.0 GPA before advancing to degree candidacy. Other prerequisites include a bachelor's degree with undergraduate experience in accounting, finance, economics, and math or statistics. The university also grants credit for certain types of professional certification. Distance learners pay the same rate as on-campus students. Wilmington University is regionally accredited by the Middle States Commission on Higher Education. Abilene Christian University ranks among The 50 Best Online Master's in Marketing Programs! Based in the Texas city of Abilene, ACU set up its master's of business administration program to prepare Christian business people for service. Students can pursue an MBA with a marketing concentration entirely online. This program features coursework in a variety of subjects, including faith and ethics, organizational innovation, and decision-making; classes are taught by Christian scholars. The typical student is a working professional, and the program can be finished in two years by taking one class every six- or seven-week term. Prerequisites include experience with accounting, economics, and statistics, and the university offers a three-week intensive class to anyone who lacks these skills. The school's goal is to provide a welcoming, Christ-centered community to all of its students. The 36 credits required for Abilene's online marketing master's are split into nine business and management classes and three courses in marketing (i.e,. digital marketing and social media, applied marketing research, and relationship marketing). The core curriculum is management oriented, featuring required coursework in leadership, accounting and finance for managers, managerial decision making, and operations and IT management. Graduates are prepared to work as marketing directors and management consultants. Applicants must submit proof of an undergraduate degree and their resume. The Southern Association of Colleges and Schools Commission on Colleges accredits all programming at Abilene Christian. Bellevue University ranks among The 50 Best Online Master's in Marketing Programs! The online marketing master's at Bellevue University is a web-based graduate degree devoted to advertising, promotion, and publicity. Current marketing professionals and other workers interested in reinventing their career are well-suited to complete this 36-credit curriculum, which covers both digital and traditional methods of marketing. The degree plan is preset and students join a cohort where they progress through the program together as a group. Students take one class at a time and communicate with their peers in forums and chat rooms. The small class sizes, frequent interaction, and tight-knit cohort format lead to increased networking opportunities. The master's in strategic marketing curriculum at this famously conservative university consists of 12 courses, which explore such topics as buyer behavior, internet-based marketing, qualitative analysis, social media, search engine marketing, and brand management. The university schedules coursework asynchronously and tech support is available 24/7. Bellevue also offers an online MBA with a marketing concentration for students who want a degree with more of a business emphasis. Applicants must have a bachelor's degree from an accredited university with a 2.5 GPA over their most recent 60 credits of study. Some candidates may need to furnish letters of recommendation or write an essay to bolster their chances of acceptance. Online learners pay the same tuition as students attending classes on campus in Bellevue, Nebraska. Mercy College ranks among The 50 Best Online Master's in Marketing Programs! The online marketing master's at New York's Mercy College is an MBA with a marketing concentration. Students can earn this degree in a single year. The advisory board at Mercy features executives from IBM, JP Morgan, Merrill Lynch, Accenture, PWC, and UBS. To accommodate the schedules of busy professionals, Mercy offers flexible scheduling, and most classes can be attended asynchronously. The credit count varies per student – some can finish after taking 33 credits, while others with less business experience may be required to take as many as 57. The curriculum is structured in four parts: a business core (24 credits), advanced business core (12 credits), marketing concentration (15 credits), and a capstone (nine credits). Core courses cover traditional business subjects, including accounting, finance, management, and communications. Alternatively, the marketing-specific content includes less-traditional classes, such as futuristic marketing, industrial marketing, consumer behavior, and marketing systems. The capstone requirement can be fulfilled by completing a thesis, coursework, a business plan, or a comprehensive case analysis. As many as six approved credits can be transferred into this program. Many participants opt to enroll in Mercy's Turbo Start, which is an intensive test-preparation program that can result in the waiver of many prerequisites; however, this program is only offered on campus. Interested students can also travel to New York to attend the college's Strategic Consulting Institute, where individuals complete projects like marketing assessments and customer research. The institute typically involves teams of students working together for eight to 12 weeks. Applications should include undergraduate transcripts and a professional resume. Students with an undergrad GPA lower than 3.0 must also schedule an interview. Submitting GMAT scores is optional. Mercy College is regionally accredited by the Higher Learning Commission. Tiffin University ranks among The 50 Best Online Master's in Marketing Programs! A small school in northern Ohio, Tiffin University specializes in programs for working adults, offering more than 35 degrees tailored to individuals with busy lifestyles. An ACBSP-accredited MBA with a marketing concentration is one such program. The curriculum of this 36-credit degree track has a digital edge, teaching students a solid background in modern technology, as well as a rigorous education in communication, teamwork, decision-making, and management. Participants use case studies, research, and analysis to study contemporary business trends and learn the practical applications of theoretical concepts. Tiffin built its online marketing master's on a business framework; 28 credits come from 14 classes in the MBA core. The marketing component consists of four courses: information systems for marketing, strategic brand management, global marketing, and a marketing field analysis where students complete a comprehensive marketing project that results in a professional portfolio. Professors teach all classes asynchronously. Classes are scheduled in accelerated, seven-week sessions, with six start dates per year. Students can add graduate certificates in complementary fields, such as small business management or leadership, by completing a few extra classes. The university accepts up to one-third of all credits for a graduate degree in the form of transfer credits, as long as they are from reputable programs and students earned a “B” or higher. Applicants must have earned their bachelor's degree with a minimum 3.0 GPA and scored 475 or better on the GMAT. Students who do not meet these requirements may be accepted on a provisional basis. Suffolk University ranks among The 50 Best Online Master's in Marketing Programs! Suffolk University's business school offers an online MBA that attracts working professionals from around the globe. The program emphasizes a high degree of interaction between students and their professors, using real-time weekly chat sessions, collaborative projects, and lively discussion forums. The average age of students is 33, and many bring a wealth of professional experience with them, which leads to ample networking opportunities. Students can choose from six areas of concentration, including marketing. The online digital marketing degree at Suffolk consists of between 34 and 49 credits, depending on a student's background; all but six credits come from the MBA curriculum. Marketing students can select their three concentration classes from a wide array of marketing coursework, allowing them to tailor their degree to match their career interests. For example, students can opt to specialize in global marketing or digital marketing. Internship experiences are optional, but Suffolk requires all MBA candidates to participate in a travel immersion seminar. Full-time online learners can finish their studies in a little over a year, while part-time students can earn a degree in two to three years. Suffolk has three priority start dates and a rolling admission policy. Applications should include transcripts, a resume, an essay about a student's career goals, and official GMAT or GRE scores. However, the university waives entrance exam requirements for students who meet certain criteria. Suffolk University is regionally accredited by the New England Association of Schools and Colleges (NEASC-CIHE) Commission on Institutions of Higher Education. Franklin University ranks among The 50 Best Online Master's in Marketing Programs! A small school catering to busy adults, Franklin University has an online master's program in marketing and communication. Few schools in the nation combine these two complementary disciplines at the graduate level. Coursework at this Columbus, Ohio institution is offered in a flexible, asynchronous format, and students can earn their degrees in as few as 16 months. This master's of science in marketing and communication is best-suited for working professionals who want to progress into leadership roles or make a career change. The 40-credit curriculum teaches distance learners about marketing research and how to develop inspiring messaging and branding. The program consists of 10 classes in subjects that include behavioral research, digital marketing strategies, and applied marketing communication theory. The curriculum concludes with an independent capstone project, in which degree candidates identify a business or social problem and create a marketing communication plan to help solve it. Graduates are well-versed in research and design and can evaluate the effectiveness of a marketing plan, assess the ethical implications of marketing, and write and present ideas in the marketplace. Franklin's coursework is all asynchronous, and students can complete the entire program online at their convenience. The university has two start dates in February and September. The admissions team at Franklin considers an applicant's undergraduate record, resume, and personal qualities and characteristics. Students with an undergraduate GPA below 2.75 may need to take an entrance exam. Franklin University is regionally accredited by Higher Learning Commission. Northwest Missouri State University ranks among The 50 Best Online Master's in Marketing Programs! Northwest Missouri State has an MBA program with a marketing concentration. About a third of this program's 33 credits are related to the concentration. Students receive a thorough education in business with a heavy emphasis on management and a high dose of marketing content. The online marketing master's program at this public, Maryville university is typically completed in a little over a year and explores business from a global viewpoint. Students receive a cosmopolitan look at the way marketing influences the international marketplace. Distance learners in Northwest Missouri State's online master's in marketing program take 21 credits of MBA courses. These cover traditional business basics with a management twist; every class is taught from an executive perspective. For example, rather than taking a basic accounting or finance class, students take managerial accounting and financial management. Additionally, an executive seminar exposes students to current business trends and their impacts on managers. Graduates leave the program ready to step into executive positions. The marketing concentration includes studies in advanced marketing communications, international business, research and data mining, and global marketing strategies. Most coursework is available asynchronously. Applicants should provide their undergraduate transcripts with a GPA of at least 2.5. The university waives entrance exams if students have a sufficient undergraduate GPA or resume. Online students pay in-state tuition. Northwest Missouri State University is regionally accredited by the Higher Learning Commission. Cardinal Stritch University ranks among The 50 Best Online Master's in Marketing Programs! A small, Franciscan Catholic liberal arts college in Milwaukee, Cardinal Stritch University hosts six fully-online programs in business, healthcare, and education, including an MBA program with a concentration in marketing. The 48-credit MBA curriculum is infused with the university's Franciscan values of peace and community and aims to produce leaders who value not only profits but also people and the planet. Stritch's business and management college carries accreditation from the Accreditation Council for Business Schools and Programs. The university has a network of 34,000 alumni; more than 50% of these individuals earned their degrees in business, providing exceptional networking opportunities for graduates. Students must have a minimum of three years' experience in business to matriculate into the program. Master's candidates begin their studies by taking a graduate success seminar. From there, they advance through the MBA core curriculum of 12 classes, which emphasize management, strategy, and systems. The marketing concentration itself includes four courses in consumer behavior, global markets, marketing management, and healthcare marketing. Students also complete two capstone projects. Applicants must have a cumulative 2.75 undergraduate GPA, but they do not need to submit GMAT scores. Students may transfer in up to nine credits from an applicable program. Degree seekers also have the option to sample a free online preview course to determine whether or not online learning at Stritch is right for them. Cardinal Stritch University is regionally accredited by the Higher Learning Commission. University of the Southwest ranks among The 50 Best Online Master's in Marketing Programs! The master's in business administration at the University of the Southwest is a self-designed major. This non-denominational Christian institution allows working professionals to create their own MBA paths, aligning the 36-credit program with their career aspirations. Students can choose from 11 areas of specialty in this degree program, including a master's in marketing; additionally, if none of these options seem right, students are encouraged to build their own program to suit their specific needs. This online master's in marketing features small class sizes and close interaction between faculty and students. The University of the Southwest splits its 36-credit marketing curriculum between 24 MBA core requirements, including coursework in marketing strategy and business analytics, and 12 credits in the marketing concentration. Marketing courses are tech oriented, featuring classes in IT for e-business, e-marketing, and innovation management. Graduates of the program learn traditional marketing techniques as well as how to advertise, promote, and attract customers in the digital age. The curriculum typically concludes with a three-credit organizational design and strategy capstone course. The university provides laptops to distance learners and supplies all of the necessary texts in the form of e-books. Courses are offered in accelerated, eight-week sessions, allowing students to move quickly through the curriculum in an asynchronous fashion. Ambitious degree seekers can finish in as few as 12 months. Online learners pay significantly less than students attending classes on campus in Hobbs, New Mexico. The University of the Southwest is regionally accredited by the Higher Learning Commission. The courses required in a master's in marketing program depend on the type of degree. A master's of science in marketing emphasizes different areas and skills than a master's of business administration with a marketing concentration. Most students seeking a specialized marketing degree pursue an MS in marketing. These programs often take a scientific approach to marketing theories and practice; students look closely at digital analytics, mathematics, and statistics. However, many master's in marketing programs allow students to customize their degree with a focus or concentration area. Popular concentrations include those related to digital marketing, such as social media marketing, new media, communications, and online marketing analytics. When choosing a program, also consider graduation requirements such as field experience, internships, thesis projects, or capstone courses. Because online marketing programs allow students to tailor the program to their interests, many working professionals who want to change or advance their career earn their marketing master's degree online. Earning a master's in marketing helps working professionals secure advanced positions and make higher salaries. Many professionals earn their marketing master's degree online before leaving their current career to work in marketing. The examples below are common occupations for graduates of master's in marketing programs. Advertising, promotions, and marketing managers: Advertising, promotions, and marketing managers work with other creative directors, such as artists and graphic designers, to create advertising campaigns. They need a marketing background to tailor advertising and marketing campaigns to the company's core audience. Market research analysts: These analysts research marketing trends to determine the types of marketing that generates the most sales in different demographics. They work with companies and individual clients to predict the potential sales of a product or service. Economists: Economists study economic issues, trends, and sales. Based on the data they collect, they advise businesses and companies on how to proceed with marketing and the production of goods and services.